Humira (Adalimumab) is a drug designed to fight autoimmune diseases and disorders. Humira stops the production of TNF in the body, which is the substance that helps transmit the sensation of pain. Immunity difficulties often occur when the immune system in a patient’s body begins attacking the wrong things. For example, it may cause swelling, joint pain, and considerable damage if left untreated. Humira stops these mistaken attacks by inhibiting the production of TNF. Humira is commercially distributed in liquid form and is usually injected under the skin (subcutaneously). Because it is a very powerful drug, Humira is only injected under the skin every other week. It is important to maintain regular checkups with a professional healthcare provider in during Humira treatments to ensure that the drug is being properly absorbed into your system. Depending on the severity of the condition, your doctor may instruct you to inject Humira at more regular intervals than is recommended on the label. Never deviate from the prescribed instructions given to you. Adalimumab is produced as Humira® by the pharmaceutical company Abbott. It is not produced by any other company, and it is not available in a generic form. Humira is typically used to treat rheumatoid arthritis, juvenile rheumatoid arthritis, psoriatic arthritis, ankylosing spondylitis, Crohn’s disease, and psoriasis. If you have any of these conditions your doctor will decide if Humira is a suitable treatment for you depending on the severity of your disease. This medication is only available on prescription from a doctor, and cannot be bought over the counter or at pharmacist. Humira is part of a group of medications known as TNF-α inhibitors. TNF-α is a chemical involved in a process called inflammation; inflammation is a way of allowing the body to protect and heal itself, and can be very useful as a reaction to injury or infection. The affected area of the body receives an increased blood flow, and various chemicals are released. The blood flow causes the area to become swollen, hot and red. The chemicals cause pain, which results in reduced movement of the area, giving it time to rest. When it is healed, these symptoms go away. However, in certain diseases, such as rheumatoid arthritis, ankylosing spondylitis, Crohn’s disease and psoriasis, something goes wrong within the body and inflammation occurs when it should not do. In rheumatoid arthritis and ankylosing spondylitis the joints are affected, in Crohn’s disease the gut, and in psoriasis inflammation occurs in the skin. As a result, these areas become swollen, red, painful, hot, and have reduced functioning. This occurs for a long time, and the process often recurs. Because TNF-α is an important chemical in this process, stopping it from functioning properly in the body is a very effective way of inhibiting the faulty inflammatory process. This is how Humira works: it binds to TNF-α and stops it acting on various receptors, which then significantly reduces the symptoms of the diseases mentioned above. Just because you have one of the diseases Humira treats does not mean that you will automatically receive this medication. 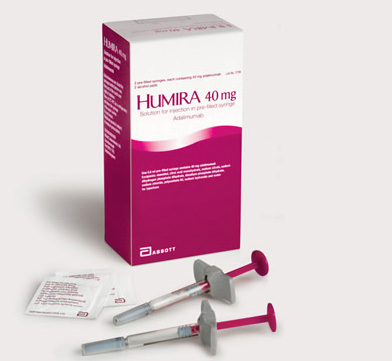 Humira is a powerful drug, and is usually used in moderate to severe cases of disease only. Your doctor may decide to test you for tuberculosis or hepatitis B if they believe you to be at risk before allowing you to take Humira. In addition, you should ensure that you are up to date with all vaccinations before taking Humira. If you are pregnant, planning to become pregnant or breastfeeding, you should inform your physician as this can affect your treatment with Humira.